Ooh, this is going to be a bit all-over-the-place, but there are so many little projects needing updating here that I figured I’d just cram them all in. Between baby knitting and de-stress knitting, The Piles (you know what I’m talking about) have been growing growing growing. First, I finished my Shetland mittens and due to all this schizophrenic weather we’ve been having, they’ve gotten a lot of play in the last couple of weeks. I think they may now be officially retired for the warmer months, but hey, we could wake up (again) to hail tomorrow and biting winds. You never know these days. I have yet to give them a proper photoshoot or a more appropriate blog-post of their own, but they were so quietly sitting in the sunlight this morning that I figured they warranted a little show-and-tell time. 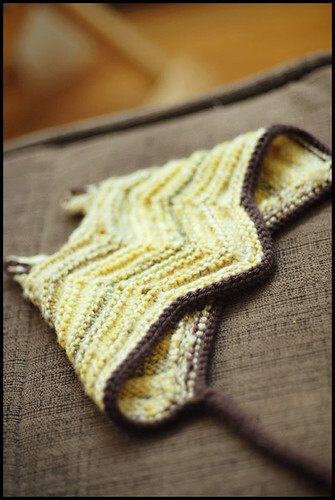 And speaking of finished projects yet-to-be-photographed-or-written-about, I’ve finished a few more little baby knits. (As an update for those who have been asking, I’m going to be an official uncle (not a father) and I’m VERY excited about it!) 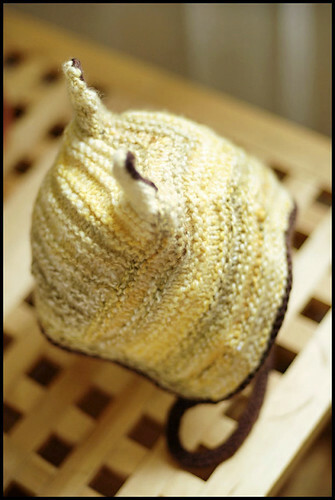 Below is a charming little vintage-style baby bonnet – a free pattern from Larissa at Stitch Marker – that is sweet sweet sweet. I knit this with a linen/wool blend (stashbustin’) and loved the crispness of the wavy ridges and soft-yet-sturdy quality of the fabric. The eyelets around the neck are for ribbon but I worked up a nice sturdy I-Cord instead. I blocked this using pins and a blocking wire (pictured) to open up the fabric. I could go on and on about how much I love blocking wires. I find I use them for all sorts of things and they just give finished garments that extra OCD punch. The stashbusting continues in the baby knitting arena: I had one skein of super-silky SWTC Bamboo – this stuff has great yardage (the skein feels a bit like a hockey puck – so weighty and satisfying) and I thought I’d challenge the skein to a duel. Is a one skein baby sweater possible? I believe so! 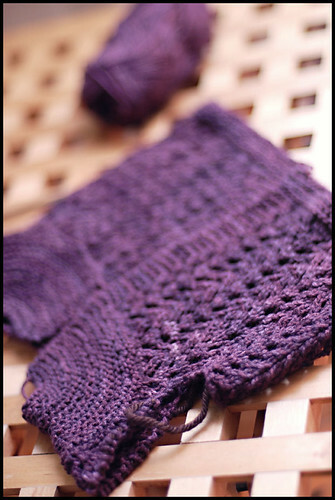 I’m done with the yoke and body and just have the sleeves left – according to the weight of the remaining yarn (40g! ), we should be golden for a newborn-sized EZ classic. The pattern is the ever-popular and always-charming February Baby Sweater from EZ’s Knitter’s Almanac (I made one a couple years back in green). Lastly: Remember my ‘Reward Cone’ of School Products Cashmere Merino? Well I couldn’t wait until proper reward-time came around and felt a mindless stockinette pullover was in desperate need of conjuring. So I started. And it’s making for some gooooood tactile gratification. More details on many of these soon – apologies again for the random project purge session! 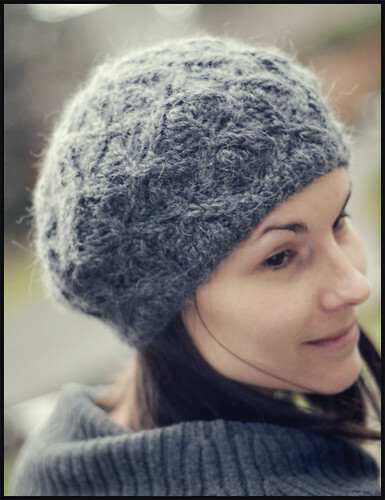 I was rummaging through my photos today, as I’ll often do when I’m seeking solace from stress (or when I’m just straight up procrastinating), and came across these pictures of the second version of the Montera Hat that I knit up at Christmas. After gifting this to a dear family friend, I completely forgot about the photos and hence forgot to share – good thing it didn’t quite get away from us! When: Christmas Eve and surrounding hours, stuck in an airport due to snow storms. 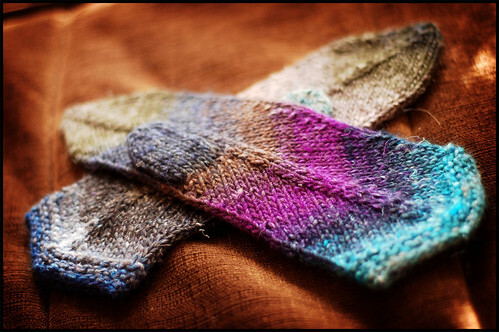 It’s much the same story as the first one – aside from using a different yarn, they were both knit during snowstorm-induced airport hysteria (collective) at Christmas. Extra gift knitting, in retrospect was the silver lining of the story, if only a minor amount of silver proportional to the rest of the chaos. I’m over it though, can’t you tell? My gauge on US 10’s was slightly tighter than instructed by the pattern, although I like the finished product with slightly less slouch. I blocked the hat over a 10″ lid to the pot we use to boil water for pasta – it’s my go-to form for blocking the slouchy and tam-like. Cardboard circles cut from old boxes work well too. 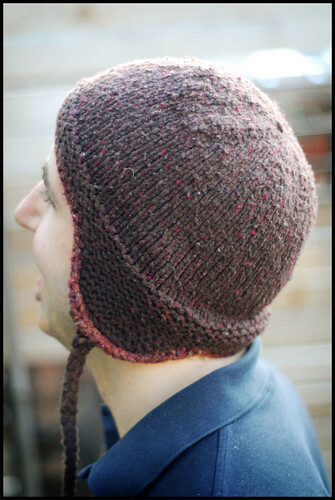 This accounts for the shaping you see, although it would fit more like a beanie without this. Knitter’s preference! I squeaked in at just under one skein – it was a nail biter, since I only had that one skein and limited time. If you knit one, I’d play it safe and grab an extra skein. 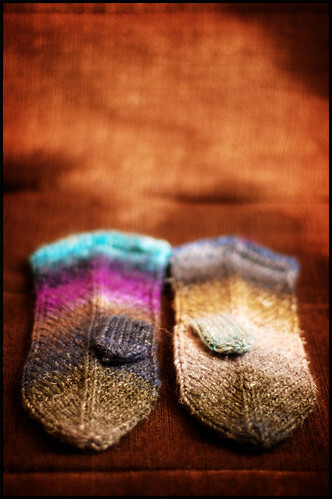 If you end up making it with just one, you can be sure you’ll have enough yarn for another! I guess I should mention the one skein trick didn’t include the survival of my swatch – I used everything. Last week was “Spring Break” (term used loosely) – although I did take a day or two off for myself to knit, think, and re-acquaint myself with my spring priorities. The weather is warming up slowly but surely and the Perfect Storm of spring, as I’ve affectionately dubbed the coming season for myself is on its way. The good news is that I’m really having a light-at-the-end-of-the-tunnel moment and there are some really exciting things on the near horizon – I’m really looking forward to sharing these with you, faithful friends! I’m entertaining the idea of taking summer off and knitting next to my air conditioner for three months as an effective transition into a new chapter… sounds good (and not at all irresponsible), doesn’t it? There has been a gaggle of baby knitting going on over here – a very important little person is coming into the world and I’ve made it my personal mission to instill a high wool tolerance, nay, dependence on the little one. Also – baby stuff can make anyone feel like a super knitter – little projects that give you the similar types of construction satisfaction (sometimes) as larger garments, take about a tenth of the time, and give you an excuse to play with all those beautiful yarns you were saving for something special but didn’t have enough of to make anything substantial with. Works for me! Now, Cisco. Here’s a project that is almost too cute for it’s own good. You know, the project that makes you giggle as you work because it’s so darned cute… and because you know that any little head when wrapped in little ears like this will be ten times more likely to induce cute-baby-sighs. 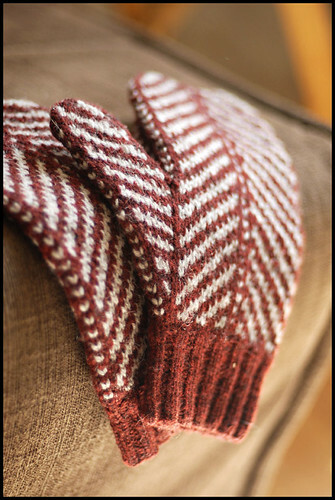 The original pattern is written for various brightly colored yarns, striped together. I opted for a more subtle self-striping look. As I always say, when the yarn can do the work for you – just let it. 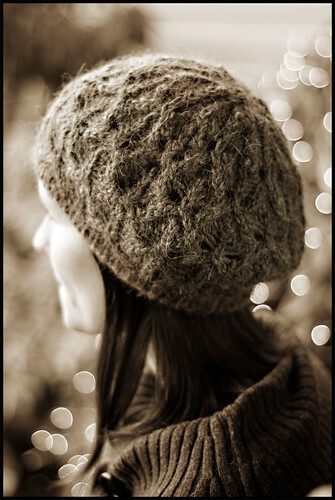 And when you have the chance to put a little handspun to good use (with garter stitch) – do it. There are some fun and clever little construction details on this – like the formation of the ears, mitered forehead point, and shaped back-of-head portion. All pieces are knit flat, but picked up and worked directly off of one another, so no seaming is involved (brownie points). Aside from the difference in yarn choices, I only made a few small modifications to the existing pattern. 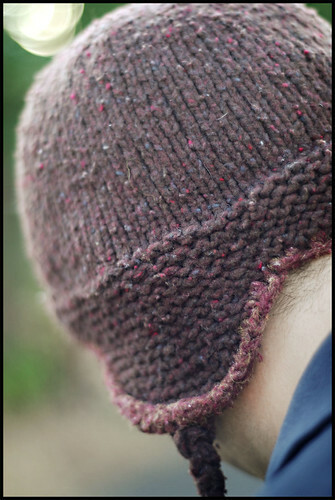 I omitted the stockinette center peak of the forehead – I liked the look better keeping it in garter, and rather than using YO increased, I worked raised bar increases to omit holes. I trimmed the whole thing in a solid contrasting color – one ridge of garter stitch with a bind off in purl from the RS. I left 3 live stitches at the base of each earflap as I was binding off and made them into I-cord. I made the I-cord just long enough to tie, but not so long as to be a dangling nuisance for parent or child. I thought the ears, being the absolute best part of the little piece, needed a little extra pop so I worked a crochet chain in the darker solid around each ear to emphasize their shape. I think they look much better with it than they did before. 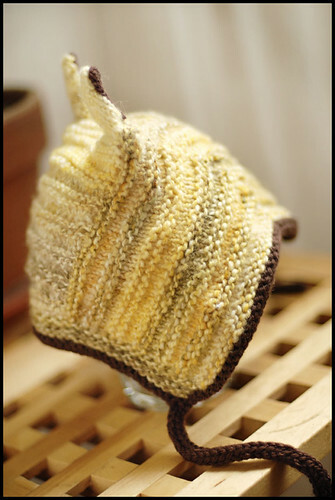 What a little gem of a pattern this is – highly recommended and definitely worthy of getting of the regular-baby-knits list if you ask me! Thanks to the lovely ladies of the Berocco DT for another winner! 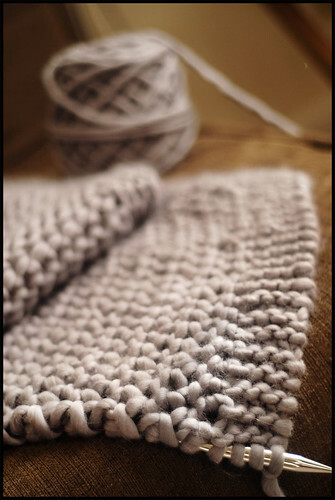 Ah, super bulky yarn – you really come through on the rare occasion that I need you. I recently came into a small stash of Soft Chunky by Wenlan Chia (more on how that happened later) and was trying to find a responsible use for it. 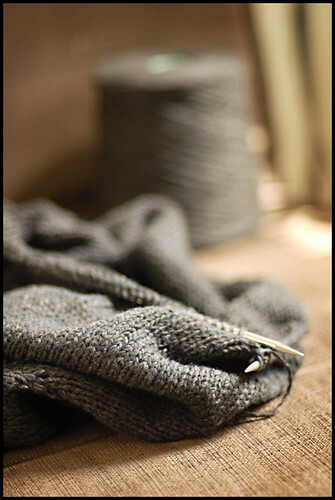 I’m not big on super bulky garments – while they’re awesome to knit and faaaast, I find they rarely ever get worn, by me at least. Soft Chunky is just that: Really soft. Really chunky. It’s a single ply virgin wool – no coarseness at all. It does feel odd knitting with little aluminum broomsticks, but dang if I don’t feel like a productive little knitter. Which right now seems miraculous. 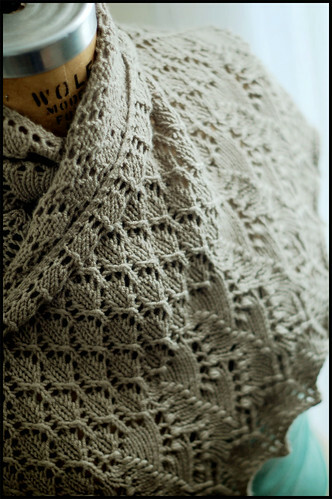 The pattern is about as straight-forward as can be – a rectangle of the simplest of all lace patterns, trimmed in garter stitch. It’s like a swatch on steroids. 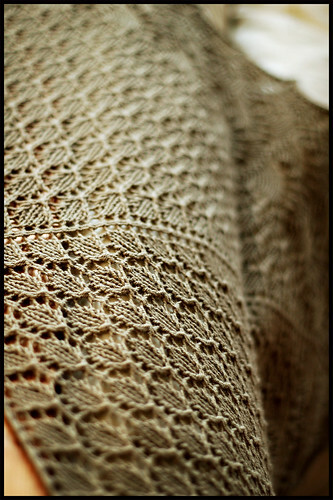 The lace is key – it keeps the weight down and plays up how soft and snuggly this stuff can be. The best part: I’m about half way in and it’s already functioning as a blanket while I’m knitting. The photograph above is the “WS” of the fabric, which in this particular pattern I think looks better (so I guess it’s the right side for me. Oh so right). And in other news – check out these cocoon like bats that I received from a friend in Michigan last week. I guess technically this could be called a companion piece to the Adult Tomten, as it was made with yarn leftovers, incorporates a healthy dose of garter stitch, uses virtually the same trim idea, and incorporates a straight-forward cleverness that I like a lot in patterns. One of many really solid patterns in Kirsten’s online oeuvre over at Through the Loops. 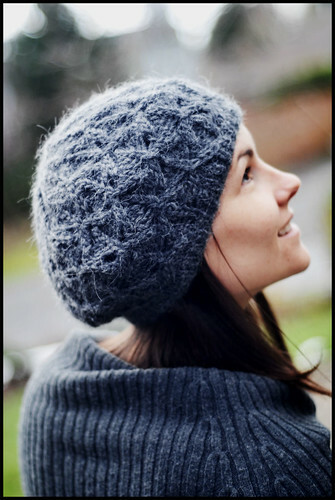 Thorpe is worked from the top down, starting with a circular cast-on and increasing regularly until the hat is the right size (the pattern offers three different sizes to choose from). Working hats from the top down, like working garments from the top down, has a lot of advantages built in, like being able to try-on as you go and tweak widths and lengths to be perfectly customized to the individual head size you’re hoping to cover. The other thing I love about the top-down option is that it makes subbing different gauges very easy and organic. 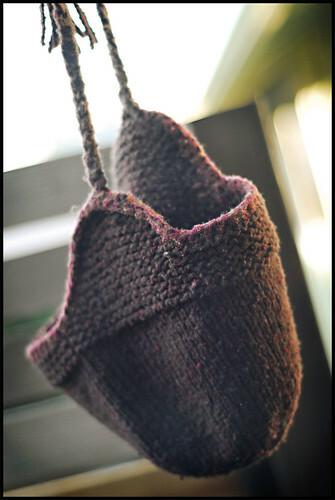 For example, I knit a dk-version last winter out of handspun, working the pattern as written but continuing increases until the size was right. I only slightly tweaked the placement of the earflaps to correspond to the new gauge – but that’s a simple adjustment. As far as the yarn is concerned, I’m sure I’ve waxed poetic enough about this stuff in post upon post in the past. This particular version of the McTaggart Tweeds (the 2-ply yarns) are being phased out, unfortunately, but not to worry! A new, gorgeous version is being ushered in – the gauge is the same, and yes, those amazing color choices that make Leanne’s yarn stand far above the rest are all still there (see the photo in my previous post). 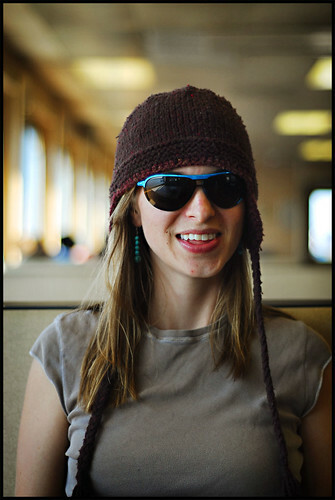 And speaking of hats – there are more coming. 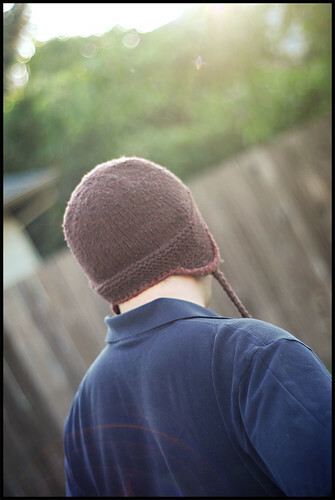 I have a few new hat patterns that are just about ready to be released here, so stay tuned. More wool. More cables. More knitting fun. See you soon! Thank you so very much for all your comments on the Pi Shawl Blanket – it really is a special pattern and a very special knit to have around. 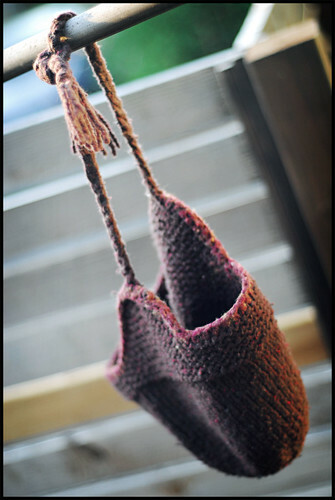 I highly recommend giving it a shot with any yarn you have lying around – it’s very versatile. There were a number of questions that I received via e-mail about the shawl (mostly about the yarn and blocking) that I’ve done my best to answer at the conclusion of this post. I hope they are helpful! And since we’re already in a lacey state of mind, I figure I’d exploit this opportunity to introduce a finished project that has been waiting for a little blog coverage for months. 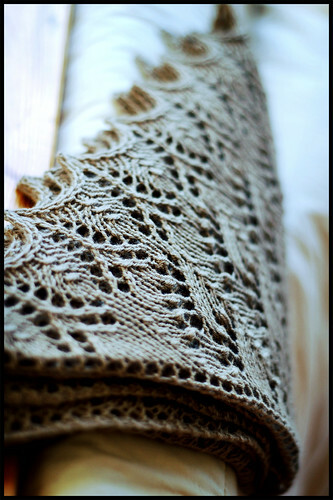 If you’ve followed my knitting for any length of time, you know I prefer knitting lace in thicker weight wools – I think the beautiful stitch work combined with something a little more heavy duty is a winning combination and I always seem to come back to it. My second swallowtail is no exception. This is a wonderful pattern and quite a popular one. I knit my first one in October ’06 with lace weight and ever since wondered how those lacey bobbles would look in a dk weight. Of the two I think I prefer the thicker one, but they’re both beautiful and have their own unique charms. Thicker yarns give a great stitch definition but don’t have as good a blocking memory as lace. I see this as an added advantage because it makes them that much more thick and snuggly. 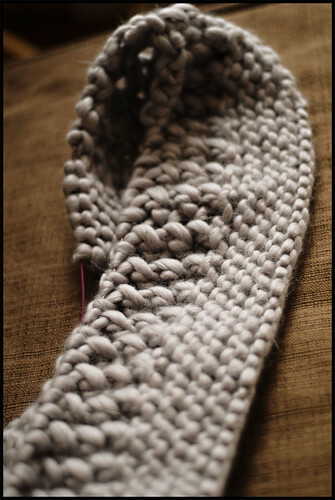 I’ll often add a couple repeats in the lace pattern if possible when working with thicker yarns to compensate for this. The yarn is wonderful – I snatched it up from a WEBS sale last year and had a great time working with it. It’s not the wooliest of wools but it’s got a bouncy, soft feel and a light sheen because of the silk that provides both elegance and warmth. This was gifted in December an I’m happy it’s getting some wear now that the daily temps here in New York are in the low 30’s. 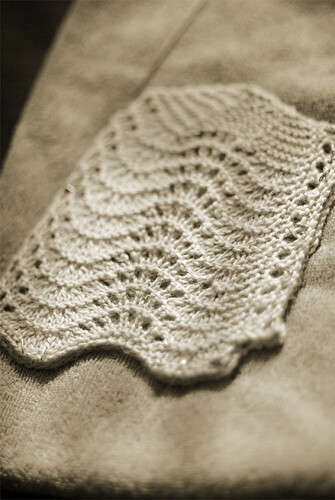 Pi Shawl Queries: A few additional details about my Pi Shawl to answer e-mails I’ve received. 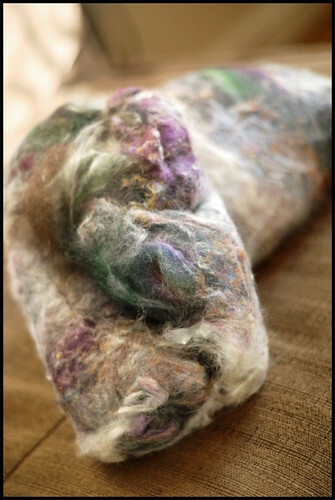 First, more specifics about the color of the wool. I received this yarn as a gift from a friend in Iceland. She purchased the yarn there in person. Schoolhouse Press does sell this yarn, but in a limited palette – which I should have mentioned earlier – and does not currently carry the color that I used. The color of my wool is titled Sea Green Heather and listed as product #1422 on the Istex official color card – viewable here. You’ll notice they have a lot of wonderful colors! Don’t say I didn’t warn you. In researching, we think that the best bet for possibly acquiring this yarn by mail order would be the Handknitting Association of Iceland, but can’t say for sure. All of their contact information is available behind the link. NOTE: it seems that the colorcard listed on their site is an older version and sites Sea Green Heather as #9736. Blocking: Yes, blocking was quite a challenge in our hardwood-floored, tiny apartment. I was hoping to be able to block the shawl on the queen-sized bed but realized very soon that this would not be possible. After some creative brainstorming, we tried a rather unconventional but nonetheless effective way of blocking – involving the box spring. The picture says it all. And finally – a few of you asked if I worked with the unspun Icelandic wool single stranded or held it double stranded. I worked single stranded. I hope that helps – I’ll add this information as a post-script in the original post so everything is in one place. Happy knitting! Well welcome back for another year of knitting fun! The holiday period always seems like a huge hurricane of so many wonderful things, not the least of which is a whole lot of knitting. Over the last couple of weeks I’ve been thinking a lot about The Tweed and where I want to go this year with knitting. I have some new plans and interesting twists to introduce this year, so I hope you’ll stick around. And if I don’t say it enough – THANK YOU – for visiting, reading, commenting, e-mailing, and general good-vibe sending. This website has been a wonderfully unexpected project in my life and I am excited to see where it will go this year. Now – January. The month in which we get to blab all about our secretive holiday projects. They’ve been knit, given, well received and hopefully well worn. Now the only thing left to do is dish out the good stuff – so that’s what I plan on doing this month. I thought I’d start the holiday knitting spew with a really fun EZ project that took me a mere couple of days and was very enjoyable. These were knit for a dear friend who is weathering the winter in rural Minnesota – she needs all the woolies she can get! Modifications: I was making these for tiny little lady hands so I nipped them down a bit from what the pattern suggests. Rather than casting on 48 stitches at the base, I did 44 and decreased down to 40 after about a 2.5″ cuff. 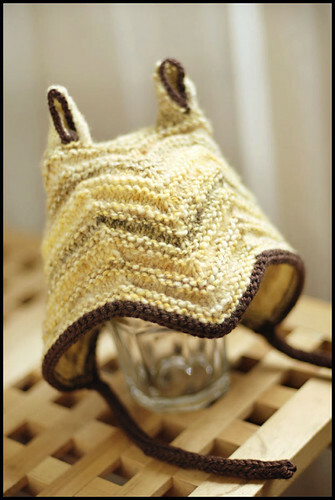 It’s a great pattern because you can virtually knit it at any gauge as long as your stitch counts are divisible by 4. Very easy to custom fit. I chose garter stitch for the cuff, rather than ribbing, because I like it better. Thumb placement is also simple – just check out the receiver’s hands and see where their thumb is located. Since it’s done as an afterthought, you don’t have to worry about thumb placement while knitting the body of the mitten. Another reason this project is super quick. 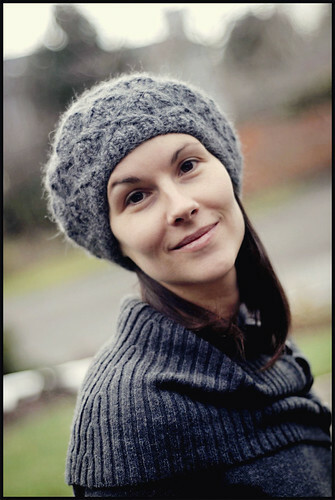 The Yarn: I had seen a couple of versions of these knit up in self striping yarns and thought they looked great. 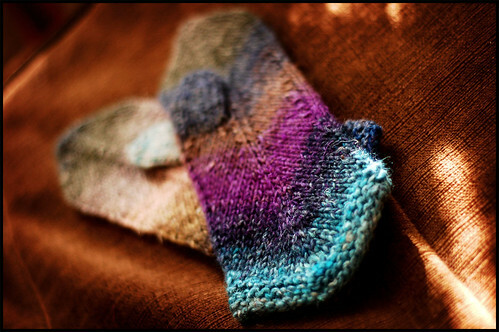 As for the striping, I just let the Noro do it’s thing – I like their asymmetry. The thumbs are put on as an afterthought as mentioned above, so I just did my best in matching color with my remaining yarn so there wouldn’t be a dramatic color shift between mitten and thumb. I have reports that they fit perfectly – which is a relief, since I was going on memory about handsize. Whew. A Bit o’ Business: If you’ve had problems e-mailing me over the last month or two – please accept my sincere apologies. My mail forwarding was malfunctioning, unbeknownst to me and bouncing a huge amount of e-mails back to you. It’s all fixed now, so don’t fret at firing e-mails on over to me at jared [at] brooklyntweed [dot] net, or just click the “e-mail me” link in the sidebar. Also, for all of you who have been searching high and low for a Cobblestone Pattern, there’s no need to look any further than your computer screen. The lovely folks at Interweave are now offering it for online purchase (details behind the link). Thanks for all of your e-mail requests after the issue sold out – it was killing me that I couldn’t get the pattern to you then, but now it looks like the problem is solved. Happy Knitting! More small wooly projects should be popping up over here in the next couple of weeks. A happy new year to all! Here’s a Christmas present that was given early to my mom when she was visiting after Thanksgiving. New York is colder than Washington state, so we both agreed it was a good choice for early gifting. It’s another classic Elizabeth Zimmermann pattern to add to the ever-growing collection I’ve started. 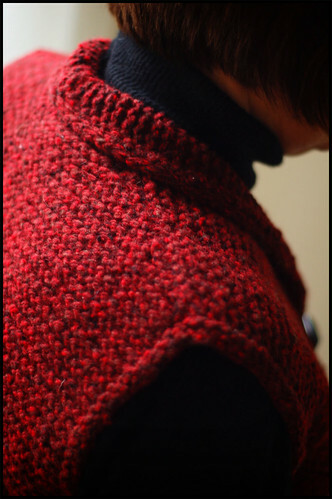 Modifications: The original pattern is written for worsted weight but I really had my heart set on using this chunky red tweed that I had in my stash. I did some pretty simple calculations to change the counts for a thicker yarn although in retrospect I think the vest would be pretty nice as-written with a chunkier yarn. My mom is a tiny little woman so this fit her perfectly, but I don’t think the modifications made a huge difference for the intended size since the chunky yarn needs more ease than worsted anyway. I trimmed the whole thing with I-cord and tried invisible I-cord buttonholes a la EZ which are really fun. 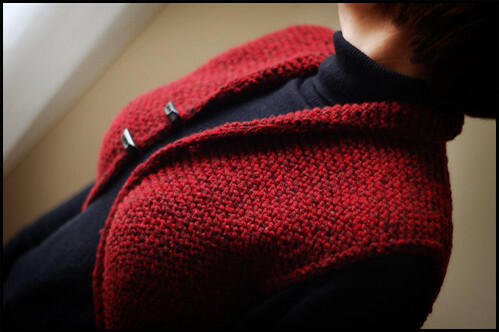 The vest is knit in two pieces – the right side and left side (this was the predecessor of Elizabeth’s “Rorschach Sweater”) and seamed up the back after knitting (see picture below). All shaping is done using short-row-style mitered corners and as usual its all garter stitch, which means no purls allowed. 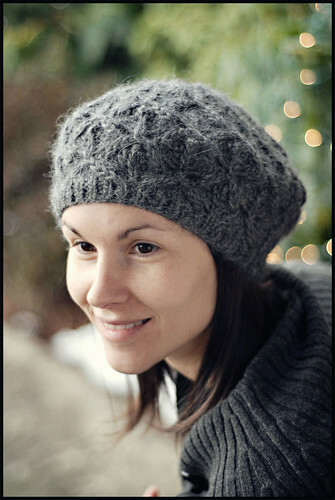 This is a quick knit – great for gifts if you’ve already exhausted someone with hats or scarves over the years. Also, this piece technically fits in the sweater category… so you’ll get extra brownie points for that. In true EZ fashion the pattern is so clever that it’s sure to keep you interested all the way through, even on a deadline. I have three days of trials left and then we’re hopping on a plane and flying far far away from The Big Apple. Here’s wishing you minimal stress over the next 10 days. I’m shooting to have one more sweater for you before Christmas – stay tuned!